Krishna&Yashoda were Kapila&Devahuti in their previous birth! I got to know about this recently!Can someone identify the source!? 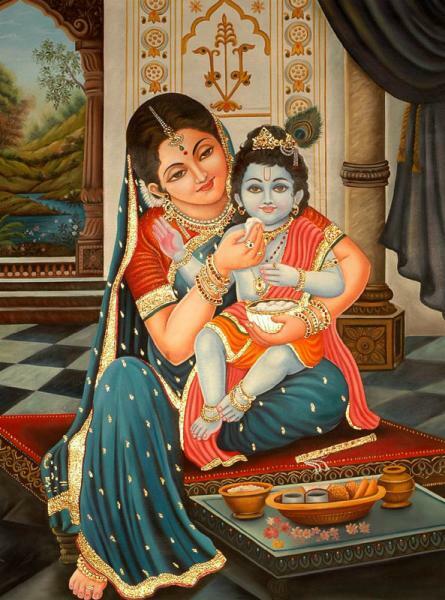 Before being born as Lord Krishna, there was another birth that Lord Krishna had taken. In that previous birth, he was known as Kapil Muni (a wise enlightened sage). In His incarnation as Kapil Muni, Lord Krishna gave His mother Devahuti(wife of Kardama Muni) the knowledge of the Self, the knowledge of Sankhya Yoga. So He had an avatar (incarnation) by the name of Kapil Muni before being born as Lord Krishna. Now, a mother's love is such that she would always want her child to keep coming back to her in every birth. So, even though she received Self-knowledge, still her attachment to her child remained. So in the next birth she was once again born as mother to Lord Krishna - Yashoda, and Lord Krishna took birth again. As Kapil Muni, He gave his mother the knowledge of the Self, but as Lord Krishna He gave her a lot of love and affection, and not Self-knowledge. So in one birth He gave her only knowledge and in another birth He gave her only love. He did not give any Self-knowledge to Yashoda. He played and did so much mischief with Yashoda. This account is pure bliss! I Remember Reading About It Somewhere ! I Really Like This Theory And Method Of Lord Krishna ! Its Like One Class Of Physics Followed By One Classes Of English Literature ! In One Birth, She Got All Knowledge And In Another, All The Love In The World ! Lord Vishnu prior to His Avathar as Krishna, once was also believed to be born as the Rishi Kapila muni. There are some scriptures and puranas referring to this. Sage Kapila was born to Sage Kardhama and was taught by him all the Vedhas and Sastras. In course of time Kapila learnt all the yogas and later authored and spread the Sankhya Yoga. 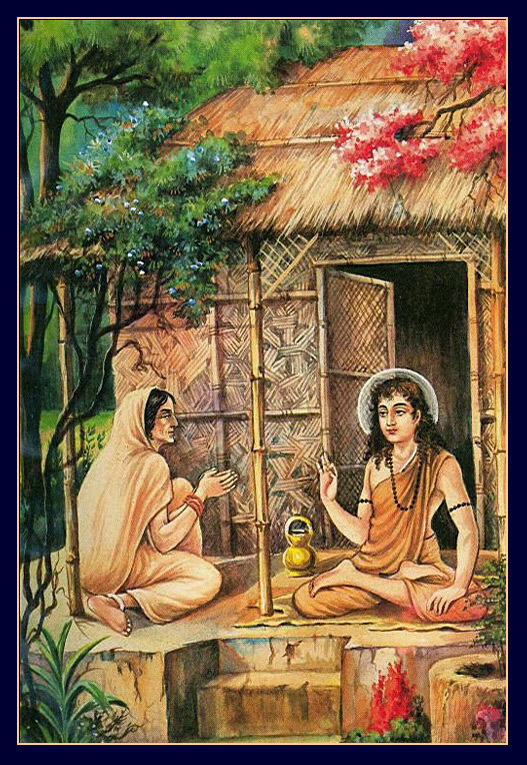 His mother Devahuthi was given upadesa by him on Sankya yoga besides the Athma bodha . Whatever be the level of highest phllosophy of life one learns, being a mother, Devahuthi could not help wishing like any other normal woman. Her wish was just limited to her desire to be the mother of Kapila Muni in her next birth also!! She considered herself so fortunate to be his mother. In his next birth, Kapila Muni was born as Krishna and Kapila's mother was born as Yasodha. Krishna says in his Gita, while teaching Arjuna, that in Rishis' he is Kapila. (Ch. 10-20). Also the 6th Chapter of Gita is named SANKHYA YOGAM BRAMHA VIDHYA in which Krishna beautifully narrates the Bakthi Yoga. In Srimadh Bhagavath Purana you can read how Krishna teaches Sankhya Yoga to Udhdhava Maharishi. Children, please recall that as she wished, Kapila Muni's mother was born as Yasodha and Krishna became her darling son. The great wonder in this combination is, there is no teaching of Krishna to Yasodha as it had been in his previous birth as Kapila. All that he did was numerous pranks and mischief which turned him uncontrollable, and she was tired of him driven to the extent of even tying him with a rope to a grinder. The erudite conversation between Devi Devhuti and her son Lord Kapil is described in detail in Shrimad Bhagwat MahaPuran. It starts in the 25th chapter of Third Skandh and goes upto the last chapter of that Skandh, i.e. 33rd. Lord always makes it a point, whenever He gets a chance, to describe Vedic conclusions in the simplest terms possible, so that even the most moronic person can understand them easily. This dialogue between mother-son duo is another such example of Lord's benevolence towards his eternal chaitanya power Jeevatma. Many such well known conversations are there. For example, in Shri Bhagwat Puran itself, in its 11th Skandh, while talking to His beloved devotee Uddhav, Lord has described so many concepts in such a straight-forward manner, that's there's no scope for any confusion. This conversation between Shri Krishna and Uddhav starts in the 6th chapter of 11th Skandh and goes all the way upto 29th. So a lot of things have been described by Lord there. Of course, after having read the extremely sweet and dulcet description of some of the activities of Divine Vrindavan and divine kunj in the 10th Skandh, not many devotees are too concerned about reading all those vedic summaries, and that's understandable. However, when it comes to the most focused and sharp and riveting summary of Vedas given by the Lord, nothing can ever come anywhere close to Shri Bhagvad Gita. But I'll stick my neck out and say that while Shri Bhagvad Gita is truly beyond any comparison when it comes to its focus and completeness and it's entirety and its breadth of knowledge that Lord Krishna gives to all of us via Arjun, the EASIEST TO UNDERSTAND Vedic summaries are to be found in Goswami Tulsidas' Shri Ram Charit Manas. That's what I truly feel. Hell man, this post is going God knows where. Ok bye. Varaali congratulations you are a Dazzler now! @Sruja I couldn't find the original source of this account.I'll be glad if anyone can identify. Nice,can you recollect! ?Sorry,I know I'm troubling you,but you've raised a hope in me! I'll say it is Theory Class followed by a Practical!